The star which had guided the Magi re-appeared over Bethlehem, and they found the Infant and adored Him, and offered Him their royal gifts of gold, frankincense and myrrh, recognizing by these His perfect Divinity, His royalty, and His prophesied sufferings. God warned them in a dream afterwards not to go back to Herod, and they returned to their lands, rejoicing, by a different route. Saint Joseph, too, was warned during his sleep by an Angel to take the Child and His Mother Mary and flee into Egypt, for Herod will seek the life of the Infant. When Herod realized that the Wise Men would not return, he was furious, and in his rage ordered that every male child in Bethlehem and its vicinity, of the age of two years or less, be slain. These innocent victims were the flowers and first-fruits of the Savior’s legions of martyrs; they triumphed over the world without having ever known it or experienced its dangers. The relics of the Holy Innocents are said to have been preserved in the splendid church of St. Paul’s; the station of today, however, was determined by the delicate feeling of the ancient liturgy that the great solemnities of the year should always be celebrated by a station at the tombs of Sts. Peter and Paul. 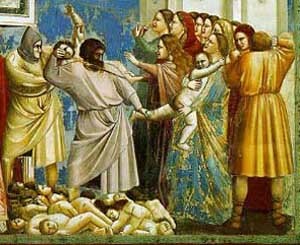 At a very early date the feast of the Holy Innocents was placed near the feast of Christmas; hence in Rome this day was observed as a day of mourning and penance. Purple vestments were used and the faithful abstained from flesh meat and foods cooked in fats. The fast, however, is no longer observed. The Gospel describes the flight of the Holy Family into Egypt and the massacre of the Innocents. How short-sighted is human scheming! At the very time that it tries to thwart the designs of almighty God, it is just then that it merely serves them the better. Herod is desirous of slaying the newborn Messias; this he fails to do, but sends instead a number of innocent babes into Limbo, there to proclaim His coming, while the Savior goes forth to enlighten and to bless the land of Egypt. O God, Whose praise the martyred innocents did this day proclaim, not by speaking, but by dying, do to death in us all the malice of sinfulness, that our lives may also proclaim Thy faith, which our tongues profess. Through our Lord Jesus Christ Thy Son. Who liveth and reigneth with Thee. in the unity of the Holy Ghost, God, world without end. R.Amen. Lesson from the book of the Apocalypse of blessed John the Apostle. In those days I saw upon Mount Sion a Lamb standing, and with Him a hundred forty-four thousand having His name, and the name of His Father, written on their foreheads. And I heard a noise from heaven, as the noise of many waters, and as the voice of great thunder; and the voice which I heard was as the voice of harpers, harping on their harps. And they sung as it were a new canticle, before the throne, and before the four living creatures, and the ancients; and no man could say the canticle, but those hundred forty four thousand who were purchased from the earth. These are they who were not defiled with women, for they are virgins. These follow the Lamb whithersoever He goeth. These were purchased from among men, the first-fruits to God and to the Lamb; and in their mouth there was found no lie; for they are without spot before the throne of God. Our soul hath been delivered as a sparrow out of the snare of the fowlers. V. The snare is broken, and we are delivered; our help is in the name of the Lord, Who hath made Heaven and earth. Alleluia, alleluia. V. (Ps. 112: 1) Praise the Lord, ye children, praise the name of the Lord. Alleluia. At that time an angel of the Lord appeared in sleep to Joseph, saying: Arise, and take the child and His mother, and fly into Egypt; and be there until I tell thee: for it will come to pass that Herod will seek the child to destroy Him. Who arose, and took the child and His mother by night, and retired into Egypt; and He was there until the death of Herod: that it might be fulfilled which the Lord spoke by the prophet, saying: Out of Egypt have I called My Son. Then Herod, perceiving that he was deluded by the wise men, was exceeding angry; and sending, killed all the men children that were in Bethlehem, and in all the borders thereof, from two years old and under, according to the time which he had diligently inquired of the wise men. Then was fulfilled that which was spoken by Jeremias the prophet, saying: A voice in Rama was heard, lamentation and great mourning; Rachel bewailing her children, and would not be comforted, because they are not. Our soul hath been delivered as a sparrow out of the snare of the fowlers: the snare is broken, and we are delivered. Sanctify, O Lord, the gifts offered to Thee, by the new birth of Thine Only-begotten Son: and cleanse us from the stains of our sins. Receive, O Lord, our gifts, in commemoration of Thy Saints: that as suffering made them glorious, so our devotion may render us innocent. Through our Lord Jesus Christ, Thy Son, Who liveth and reigneth with Thee in the unity of the Holy Ghost, one God Forever and ever. R.Amen. A voice in Rama was heard, lamentation and mourning: Rachel bewailing her children: and would not be comforted because they are not. May the votive gifts, O Lord, of which we have partaken, through the intercession of the Saints gain for us help, both for this life and life eternal. Through our Lord Jesus Christ, Thy Son, Who liveth and reigneth with Thee in the unity of the Holy Ghost, one God Forever and ever. R. Amen.